H opes to be a second Rudy Valee. C elebrated for those eyes. 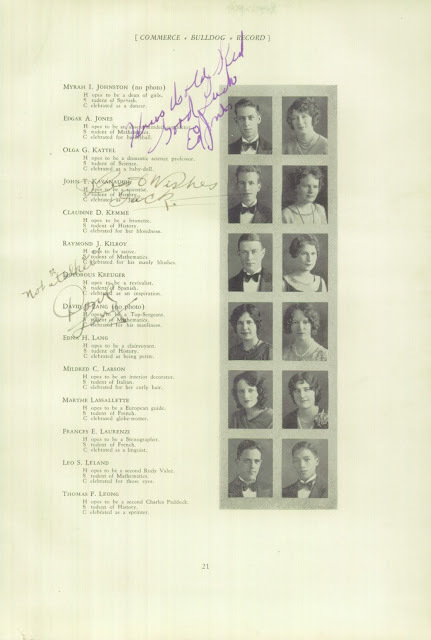 "U.S. Yearbooks, 1890-1979," , MyHeritage (http://www.myheritage.com : accessed 2 April 2018), , "High School of Commerce Yearbook, June 1930," page 25, Leo S. Leland entry. Leo S. Leland is my wife's father. This is his high school yearbook entry as a senior in the Class of 1930 for the High School of Commerce in San Francisco, California.